The Elaborate Vertical Lace stitch is a lace stitch that consists of a stockinette design which runs down the work followed by lace situated in between. Despite its name, this lace stitch is not complicated to knit nor are the techniques used elaborate or difficult. Done in a 2-row repeat and in a multiple of 7 stitches plus 1, the Elaborate Vertical Lace stitch is a quick knit and easy to remember. 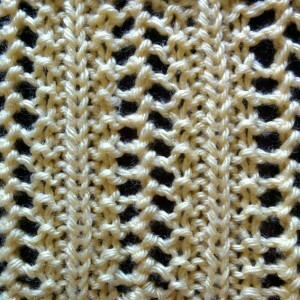 Note: like most lace stitches, blocking is recommended for optimal results. Row 1 (RS): k1, *p1, k1, yo, p2tog, k1, p1, k1; rep from * to the end. Row 2: p1, *k2, yo, p2tog, k2, p1; rep from * to the end.